I've whined many times about the difficulty of the Russian language. Very long words, often difficult to pronounce. Recently, I started learning basic Georgian phrases for the journey - hello, goodbye, thanks, my name is, how much?, nice to meet you...This language is comprised of many harsh and unusual sounds for a native English speaker, and it's even more challenging to grasp than Russian. Almost any ounce of foreign vocabulary I know is useless for learning Georgian. For instance, if you know English, many Spanish words aren't so hard to comprehend, and even French to some extent. This perception is based solely on my travels in France, and daily communications with native Spanish speakers in my immigration work and life in Northern Virginia, where we have a huge population from Central America. In fact, whites have been the minority in my region for many years. I'm not concerned about perfection or grammar when learning these languages, just the spoken element so I can try to communicate with locals a bit in their native language. I think it's very important, and you should always make an effort to learn standard, universal phrases when visiting a foreign country. The phrase itself is easy enough, it's a matter of knowing how these particular words are spelled. Were you taught American or British English? It seems almost everyone learns the latter in school, or through independent studies. I love that one! Never saw it before. But at the risk of sounding like a nag: It's not a tongue-twister. A brain-twister, rather. Saying/hearing it presents no difficulty, seeing it on the paper/screen does. ...Just started reading 'Rates of exchange' by Malcolm Bradbury. I think it's right up your alley, Ms. Traveler, even if a bit out of date. Ha. Good one. I like it. I love English - so easy to express yourself. Very direct and simple. I'm into Italian now....don't like all this masculine and feminine thing any more! I love the way it sounds though. I haven't heard Italian spoken much honestly, and have never been to the country. I don't like when men speak effeminate languages, and Slavic languages are very "manly" and harsh. :)) Georgian is not Slavic, but has this same harsh tone, to me at least. have you already mastered "Dilah mshvidobisa"? I haven't mastered anything yet. :)) Still trying to get the alphabet down. I'm not a good linguist, never have been. 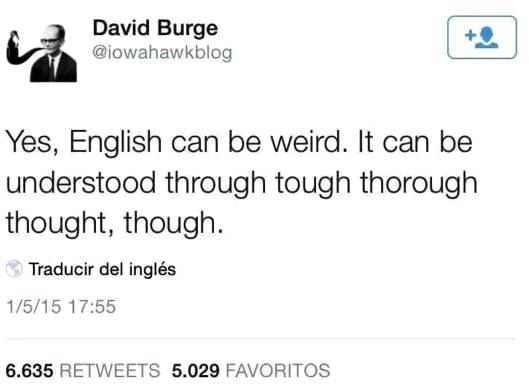 I think your tweet example is quite characteristic for English (especially regarding the phonetics). Context-dependent - this is a challenge with all languages. For instance, I never really understood if it's disrespectful to say Привет! rather than Здравствуй! to an older person in Russia, if you don't know them well. The first is so much easier, and I always prefer informal greetings. Even in business relations, I rarely say "hello", I always say "hi." The best English is German English. dont mess wis se GERMANS! DANKE! its tarrible and no one can understend this! Most of my readers will understand. :) They have very good English skills. i got it. Though i always mess up with worlds like that. That and irregular verbs. It's my native language, so I can't properly judge whether it's simple. However, I notice one distinction. Americans aren't so "proud" of their language, or tied to it that they become hysterical if someone mangles it, or speaks in a broken manner. Meanwhile, Russians seem to be perfectionists in this regard, afraid to speak for fear of making a mistake. Or, conversely, shouting at me in other blogs or calling me disrespectful for not writing in Russian, when I know very well that the blogger understands English fine. I want to encourage everyone again to not be scared to speak the language...Americans are more forgiving of mistakes, we are totally accustomed to ESL speakers in our country, and not so hyper-critical of errors. -gorillas live in families, the head of the family - a male (sametz). American tourist: a sametz is a man? - A man has money, and this is a male (sametz)! One article I read warned about mangling the beautiful Georgian language, and risking offending locals. For example, they said many tourists pronounce the name of the city გორი (Gori), so that it turns out to be the word for "pig". :)) Well, I think locals must be used to it and hopefully forgiving. People who claim that Russian language is hard and sophisticated probably don't know English language well. Southern wording (and accent too) always makes me to scratch my head. I know English very well, and think Russian is complicated. I can barely understand Southerners at times, it's a common problem. :) Btw, both men and women should be prepared to be called "honey" and "sweetie" A LOT if they're visiting the South. o man.. what the hell is that? I think you must be brilliant enough to understand. :) You write in English very well.